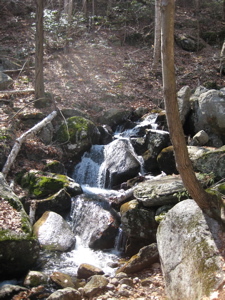 A month prior to this solo hike, Rob Y and I took in a bunch of the other Southington regional Tunxis Trails which resulted in a write-up called, Some nICE Surprises. 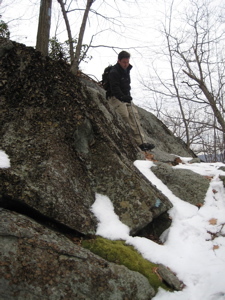 After finishing the writing, I realized that the coolest part of our hike that day wasn’t included – the southen end of the Compounce Ridge Trail. And, ironically, it was that part of that trail that contained the “nICEst surprises” – go figure. 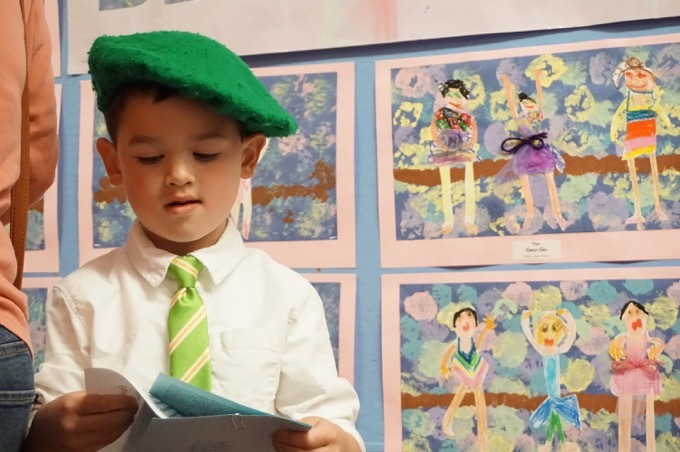 Rest assured, it will all make sense after you read this report. Maybe. I was very happy to get out on a sunny and calm day to finish up the Southington region of the Tunxis. This would mean I could definitively put away my maps of this area and move on to the even-more-confusing (and more interesting) Burlington section. That’s not to say that this section isn’t interesting – far from it. 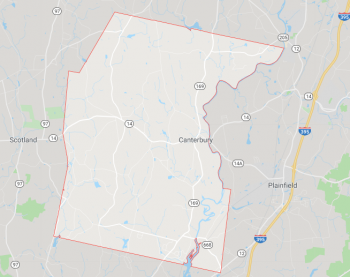 First of all, as I continue to learn through these hikes, there are lots of cool places in central Connecticut very close to population centers that the tens of thousands of people who live in those population centers are unaware of. Here I was, once again, traipsing through Bristol (Bristol!) soaking in some of the best views in the whole state. I’m not joking; Continue reading and I’ll prove it. 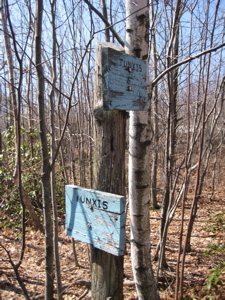 If you are ever in a situation where you must decide between the southernmost 4 miles of the Tunxis Mainline trail or the 4.6 miles of the adjacent Compounce Ridge Trail, do not go with the name allure of “Tunxis!” Instead, opt for the far better Compounce Ridge Trail. (Of course, that decision is purely hypothetical as both end in the middle of the woods and don’t loop back, but you get my point.) 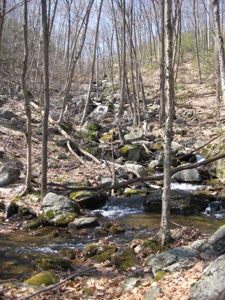 This trail is relatively great as Central Connecticut trails go. I split my hike of it over two separate loop hikes, which is why there is significant snow and ice in some of the pictures – it’s not like the altitude gain is 4000 feet here. 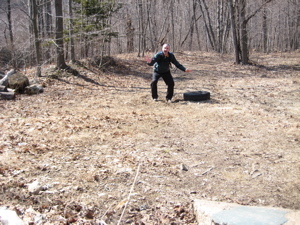 I began my trek from the northern terminus which is somewhat difficult to find. There apparently used to be a nice little parking lot right off of Lake Avenue/Sunnydale Avenue right off of Route 229 in Bristol. 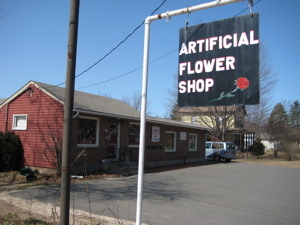 This is a high traffic area with gas stations and box stores. Plenty of parking is available – but the trick is, finding the trail head. A commenter noted that you can park at the Aldi or the commuter lot though. 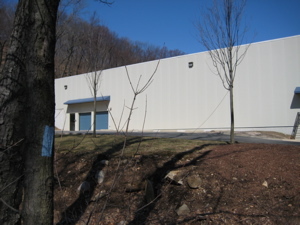 I drove around and up Mountain Road and parked at some empty storage facility about an eigth of a mile from the trail’s start. In hindsight, I’d have parked across Lake Avenue in the lot for the war memorial park or whatever it is. 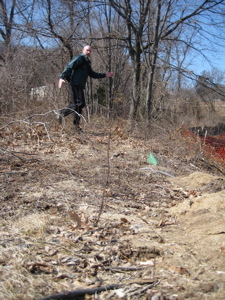 At any rate, the first several yards of the trail are somewhat comical – the construction and new housing development has played havoc with this little stretch, but in a valiant effort to preserve it, blazes are blazed through the 9 feet of “forest” that still exists. I would enjoy watching some of our more well-fed hiking friends navigate the first 30 feet, as there are some squeezes that I barely fit though. 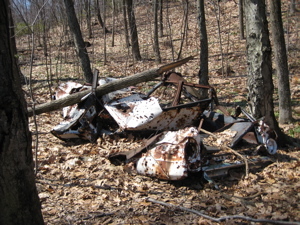 Ah, woodland hiking in urban Connecticut at its best! After navigating this quickly disappearing little copse, the trail turns left and skirts the backyards of suburban Bristolites. A sharp turn right, across a power line scar, up some stone steps, a jog left (south) and I was finally in some real woods. 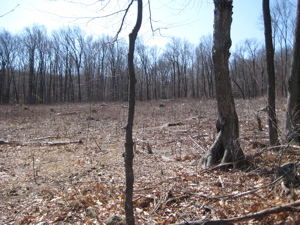 Of course, these woods were chock-full of old forest roads and ATV trails, but woods nonetheless. I must admit, this 3/4 mile stretch below Castle Rock is the first time on the Tunxis where the trail was not blazed/cleared perfectly. In one spot, it was totally overgrown with some pricker bushes and in another, I wasn’t comfortable that I was actually on the right trail – but perhaps on an ATV trail instead. I’m sure this will be taken care of this spring, however. But since marking the trail through there would prove rather difficult these days, a poorly marked trail off to the left of the slash ambles down the hill towards its appointment with the Compounce Cascade Trail and the wonderfully named Cusgutter Brook. At this intersection, I suggest you do exactly as I did – hop off the Compounce Ridge Trail and head straight uphill along the Compounce Cascade Trail. This trail is wonderful. 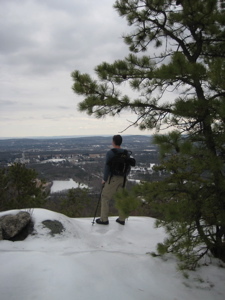 When one hikes it, one feels as though he is hiking a “real” trail up a New England granite mountain. Perhaps this is simply because the trail doesn’t namby pamby up the hill (the “hill” being the 964 foot Compounce Mountain) but rather just charges right up. 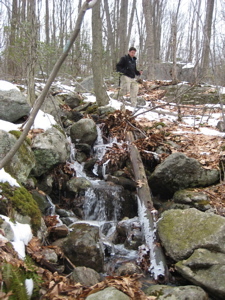 After crossing the brook a few times and scrambling up, across, and over slickened rocks, the trail evens off a little bit before veering 90 degrees left to cross a couple bridges. 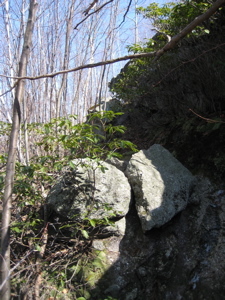 It then climbs up again in a final push to the top; here, the vegetation changes drastically to that of laurel and blueberry bushes. Once on top, pitch pine is added to the mix and it’s really quite beautiful. 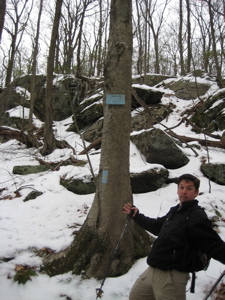 Also, once on top, it reaches its southern/western end and intersects with the Compounce Ridge Trail again. Now it’s getting good. On top of the ridge line now, I started hitting the views I’ve been alluding to. 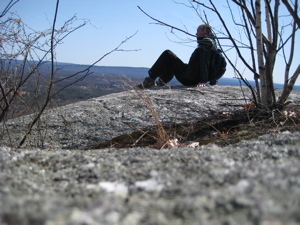 Immediately south of the end of the Cascade Trail, I got to Julian’s Rock. Awesome. With a lone pitch pine keeping me company, I soaked in the view… and it’s a very unique view. To the left (north) I could see Mt. 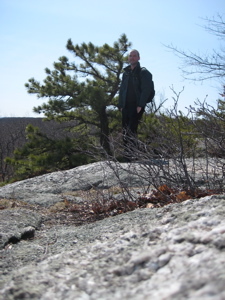 Tom near Northampton, MA and then, following the ridgeline south: Mt. 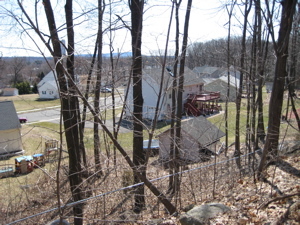 Westfield and Talcott Mountain, Rattlesnake straight ahead and the Hanging Hills in Meriden off to my right a bit. Further south, there was good ol’ Sleeping Giant again and the faint shimmer of Long Island Sound. 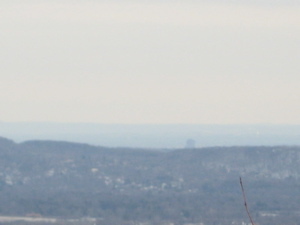 What is really cool about this view is that the tallest buildings of Hartford are visible just over the Metacomet range. 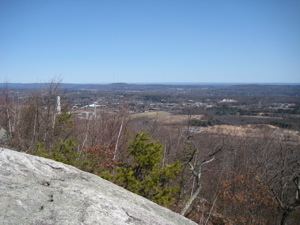 It really is one of the better views east of Litchfield County and worth any effort required to get there. After eating a snack, I continued south a bit and reached the intersection with the Bobcat Trail at “The Gateway.” On this day, I went left to finish off the last piece of the Bobcat (described in my Southington Region South report), and rejoined the Ridge Trail before finally finishing out my day along the bottom section of the Cascade Trail. Suffice it to say, the last (which is actually middle) section of the Ridge trail stinks. It’s just a rutted forest road with really nothing exciting to report. Actually, that’s not true. 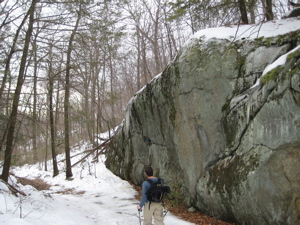 The short section from Julian’s Rock includes a 42% slope – the steepest on all the Southern Tunxis. But it’s not like that’s fun or anything. 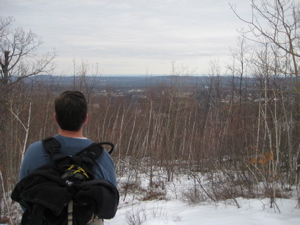 Starting from “The Gateway,” I will pick up the Ridge trail from my previous hike with RobY. Note: It’s winter again. Brrr. 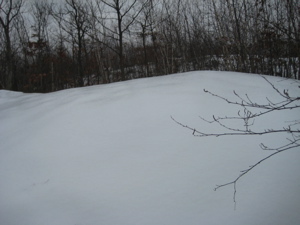 After the intersection with the other trails, the hike doubles back and ascends very steeply up to another knoll top. As this was the first time Rob or I had been here, we weren’t expecting too much. We thanked ourselves for having crampons on and crunched up to the top. Wow. We were both floored at the views before us (same as described above). Although I’m sure not many hikers make the trek up to here, thousands of people do get to enjoy the same views – via the gondola ride from Lake Compounce Amusement Park down below. And, if you have loads of free time, here’s a video of the”Skyride” – should you know you’ll never really experience this place yourselves. Also here is the named Norton’s Overlook. After which, some sadistic nut decided to route the trail straight down a cliff. Perhaps it’s easier without all the snow and ice, but not by much. In all my hiking from Georgia to Maine, this 30 foot section of this trail was one of the craziest. This will also be one of the rare times where I will feel in slight peril on my Connecticut 400 quest, I believe (not including the highway crossings I have to look forward to). 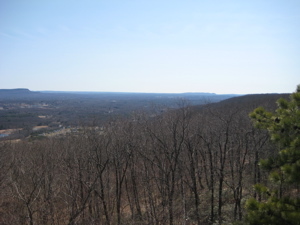 Anyway, we survived to see Compounce Overlook (same view, but nowhere near as nice) and to do the unnecessary ups and downs the trail takes on its way down to the intersection with the Steep Climb Trail – also described in my other write up. 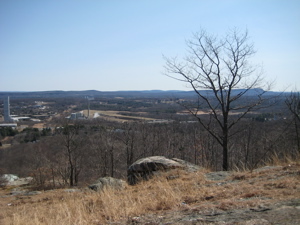 The last half mile ascends fairly steeply to rejoin the Tunxis Mainline Trail at the summit of Libby’s Lump – but not before going over Madsen’s Mound! No, I’m not making any of this stuff up. 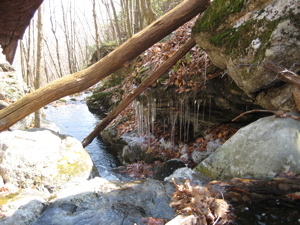 After circling back north on the Ridge trail I arrived back at the spot where I originally went up the Cascade trail. Now I headed down (east) the mountain to end my day of woodland hiking. All in all, the trail is not too exciting here – so why separate this section out? Simple: Because it skirts the amusement park property and goes right next to the graveyard of dead rides! Amazingly, I think I could have walked right into the park from this out-of-the-way back route with no trouble at all. (I didn’t try.) 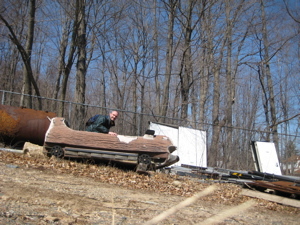 It was fun to check out all the broken junk back there – I highly recommend it. I was really looking forward to buying Hoang a nice plastic bouquet. Ah, only in Bristol. Hi I’m zac. 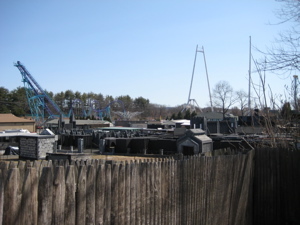 I’ve noticed that if you take the skyride at lake compounce in southington. You can see atv trails. How do you get to those? This site does not condone the massive destruction that ATV’s cause. thank you for posting this. We have been hiking here for years and agree with everything you have said. Have you ever wandered to the right, i believe its the yellow markers? Its gorgeous, its a hike for sure with a surprise at the end. We have never seen any wild animals? have you? I helped cut the Compounce Ridge trail in the late 70s or early 80s (I don’t remember exactly when), and helped maintain these & other trails. The guy who managed many of the CT blue trails for decades was Libby, and Norton was his 2nd in command (I don’t recall their first names). They both worked the team hands-on to cut Compounce Ridge. Norton named a section after Libby & vice-versa. At the time, Libby was very old (he’s since passed away); you wouldn’t believe that he spent every weekend leading a team of teenaged volunteers maintaining trails. He was trying to convince Norton to take the reigns so he could retire, but Norton (a young-ish guy) didn’t want to commit all his weekends to such an undertaking. I left the group before I ever found out who took over. I’m sad & annoyed to hear that the Bristol Fish & Game Club blocked our access because 1) I used to maintain those trail sections, too, and 2) I used to have a part-time job with the Club (unrelated to the trails). I am taking some time off of work and want to take advantage of some of the local trails. What to you recommend would be a good starting point for someone of good physical condition in and around Southington. I really enjoyed this piece you wrote! Great Job! Today I took a little hike up to those trails. 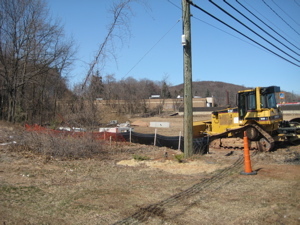 The “blue blazed” trail which goes underneath the power lines also lead to a dirt road which then leads up the mountain. My friend referred to it as Southington Outlook. 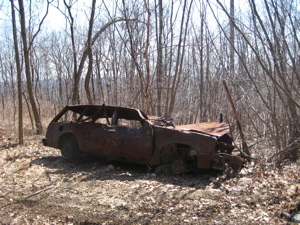 I had parked my car on land that belonged to the Bristol Fish and Game but they didn’t give me any trouble. Maybe they are more scared of me even though they had the guns. Anywho, I’ll post a link to the Flickr photo set. GPS coordinates are embedded in each photo. At the northern terminus it’s easy to find parking right in the commuter park & ride lot next to Aldi. The trailhead isn’t marked but it’s not hard to pick up the trail where it starts in the little strip of greenery between the parking lot and Aldi. Unfortunately the Compounce Ridge Trail is closed with No Trespassing signs and blacked-out blazes, right before the junction with the Cascade Trail (heading south). The CFPA website has a short blurb about it. ATV damage is really bad on the Tunxis portion, 3 or 4 tracks wide in a lot of places. I didn’t see any animals but there were a lot of hawk feathers around.